In Tomb 26, March 2016. Photo: Martin Fera. 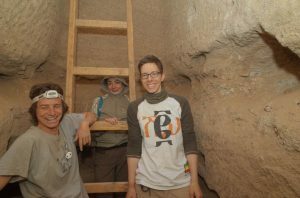 Andrea Stadlmayr, Marlies Wohlschlager and I were busy working in Tomb 26 earlier this year. The season has been very successful – yielding nice finds like scarabs, a Base Ring II juglet and a number of other complete ceramic vessels. As physical anthropologists, Andrea and Marlies are focusing on the human remains from the tomb. A minimum of 10 individuals were documented from different levels. 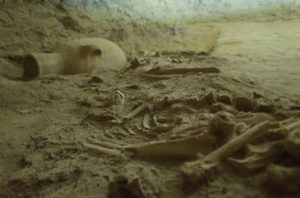 These skeletal remains are, despite of a rather poor state of preservation, highly interesting for key questions of AcrossBorders related to the occupants of Sai during the New Kingdom. We know that there were several phases of use of Tomb 26 – based on the stratigraphy and pottery we are currently trying to establish a sequence. Today, in order to plan the next season with a special focus on the documentation and processing of the skeletal remains, we had a very productive meeting here in Vienna. The physical anthropology is conducted within my FWF START project, hosted by OREA of the ÖAW. We are grateful for support from the NHM and the cooperation with VIRIS Laboratory of the University of Natural Resources and Life Sciences for the strontium isotopic analysis. Looking at the documentation from Tomb 26 earlier today, and especially on the 3d models by Martin Fera, it was almost like being there again. Looking very much forward to the upcoming season 2017 and a re-union at the site! This entry was posted in Archaeology, Fieldwork, New Kingdom, Sai Island and tagged tomb 26 by Julia Budka. Bookmark the permalink.